I took five semesters of Spanish throughout high school and college, and have retained enough for me to cause an international incident. That said, there's something about Tejano, Tex-Mex, norteño, mariachi, or ranchera music that I've always enjoyed--even though I don't understand any of the lyrics. Ah, the joy of being oblivious. Much like religious vinyl, I find quite a few Hispanic records when I go digging in the dollar bins. Here lately I buy pretty much everything with a Colorado address on the label, as they tend to be passed over by folks looking to score the next big eBay sale. That said, last year a most generous fellow Colorado record collector mailed me a batch of state Hispanic singles he had no interest in. 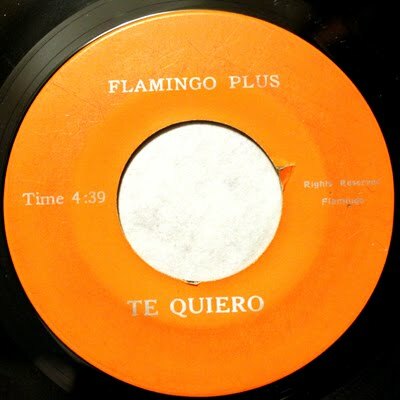 Among the singles were three by the group Flamingo Plus. As is most always the case, the vinyl had few clues to go on. The label was blank, however it credited James Vigil on saxophone, as well as Nick and Jane Herrera. A quick Google search discovered that a Jane Herrera, who had been married to a Nick Herrera, in Denver, passed away last year, at the age of 75. I couldn't find any other additional information (Correction - comment below says they were brother and sister). 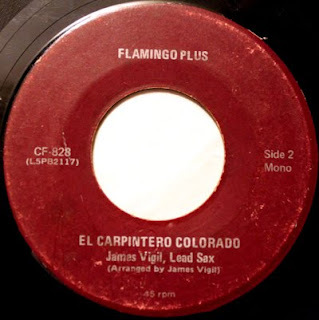 I had two copies of "Tu Destino," however one copy had a flip of "Llorando, Llorando" (both credited to Crystal Sound Recording in Denver), while the other had a b-side saxophone instrumental, "El Carpintero Colorado," and no notation of where it was recorded. Nothing really standing out here on either recording. However, a third single, from what appeared to be the same group, sounded nothing like the other two. While "Solamenta Una Vez" is your standard bolero issue, the flip, the bilingual "Te Queiro" was heavy on organ vibes, and rocked out. 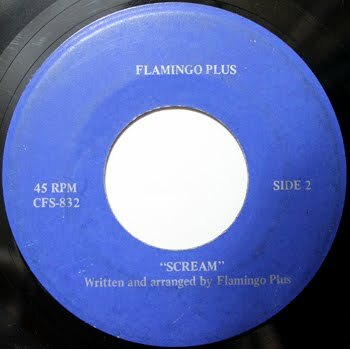 EDIT 7/3/12: Recently discovered another Flamingo Plus record, which was offered to me from a wonderful overseas seller.